There are links between Luther and Francis that help convince me we are now entering God’s time for healing and reconciliation between our two communities. Both Luther and Francis are extremely pastoral in their approach to ministry. They would seek to bring people closer to God by drawing them closer to each other; and they have a strong focus on the Holy Spirit’s gift of joy. It is said of Luther that he “strove to replace bad religion with a faith that valued freedom and justice instead of narrow orthodoxy and moralism, a religion that opened minds instead of closing them” (Scott H Hendrix: Martin Luther: Visionary Reformer, Yale University Press, 2015, xii). I hear something similar in the words of Pope Francis when he writes, “More than by fear of going astray, my hope is that we will be moved by the fear of remaining shut up within structures which give us a false sense of security, within rules which make us harsh judges, within habits which make us feel safe, while at our door people are starving and Jesus does not tire of saying to us: ‘Give them something to eat’” (Pope Francis: The Joy of the Gospel, 2013, para. 49). For both Luther and Francis, lack of joyfulness is a threat to hope. 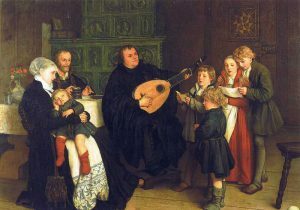 In an analysis of 21 of Luther’s letters to depressed friends and associates between 1527‒1534, Australian Lutheran pastor, Stephen Pietsch, explores Luther’s ‘theology of joy’ which Pietsch describes as having “the potency for comforting the depressed (so) that it functions as the exact ‘countervailing force’ to depression’s sadness and despair” (Stephen Pietsch: Of Good Comfort, ATF Theology, Adelaide, 2016, p221). His letters are personal, kind, gently challenging, concerned for both the physical and spiritual well-being of the recipient, reflecting an exemplary pastoral sensitivity. His style would not be used today but it remains essentially quite admirable. Moreover, he joins music to joy as an ideal way of praising God and lifting the human spirit. Since his election in February 2013, Pope Francis has written and preached almost entirely on the theme of joy. Two major documents, The Joy of the Gospel (Evangelii Gaudium) and The Joy of Love (Amoris Laetitia) were complemented by his initiative to invoke a Synod on Family Life (2014‒15) and a Jubilee Year of Mercy (2015‒16). Luther urged people to laugh and joke, to play games and to sing; to be actively involved in music-making (SP 246). As an evangelising tool he ranked music second only to theology (Kendrix 198). In 1530, nine years after his excommunication when he could well have become bitter and vengeful, he writes, “Cheerfulness of heart is the life of a person” and “God is not a God of sadness but a God of consolation and joy, just as Christ himself says, ‘God is not a God of the dead but of the living’” (SP 280‒1). The openness to dialogue, the growing good will among Christians and the climate shift from intolerance to an atmosphere of friendly contact and participation in everything we can share together, have all contributed to a growing desire that the unity for which Jesus Christ prayed become the witness so needed by our waiting world. It should not surprise us to discover, on arrival in heaven, Martin Luther and Pope Francis locked in friendly embrace – if not in complete agreement, certainly at peace with one another and smiling at their welcome as they each hear the Lord Jesus saying: Well done, good and faithful servant. Enter into the joy of your Master. This is the fifth and final part in a series by Fr James B Lyons, delivered in May 2017 for the Lutheran Church in Wellington as part of their commemoration of Luther’s 500-year anniversary.